This week has been Science and Engineering Week at Plymouth Museum, and there have been several stands in the museum with different activities related to disasters that cause extinctions. On Tuesday, Wednesday and Thursday groups of school children aged 4-11 came to the museum to learn about these disaster, and on Friday and Saturday it is going to be open to the public. I have been helping out on a stand looking at what might have caused the dinosaurs to die out, concentrating specifically on meteorites. The activity was split into three sections. The first section was an introduction into what dinosaurs and meteorites are, to make sure that all of the children had a similar level of knowledge about the subject. We explained that there a three types of meteorite - iron, stone and stoney iron, and that they all are magnetic due to the iron within them. 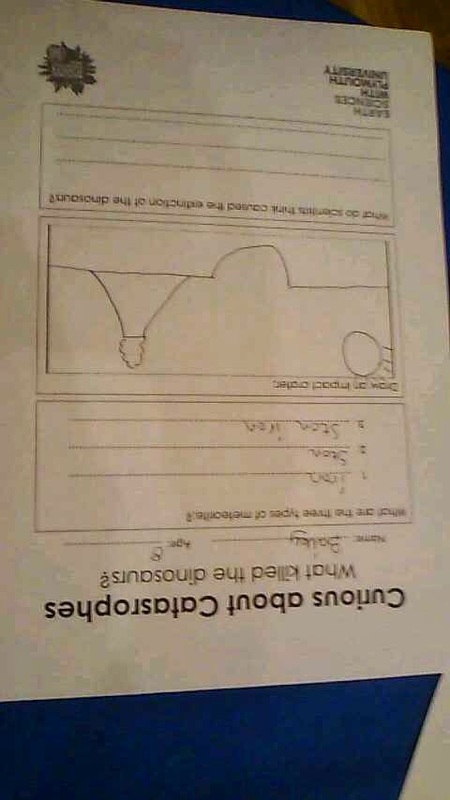 The second section involved us explaining what impact craters are, and that there are two types - simple and complex, before doing an experiment, where the kids could make their own craters. This involved dropping a ball into a box filled with black beans, then couscous, then sand mixed with flour - this was to help show different layers within the Earth. We had two boxes and two balls - a heavy one to represent a heavier iron meteorite, and a light one to represent a lighter stone meteorite. Two of the children from each group dropped the balls into the sand boxes, and we then took them out and looked at the craters that they left behind. The heavier ball created a larger crater, showing the different layers, and the lighter ball created a smaller crater, which barely dented the sand/flour mix. The photo below shows one of the larger craters which was made by the larger ball. 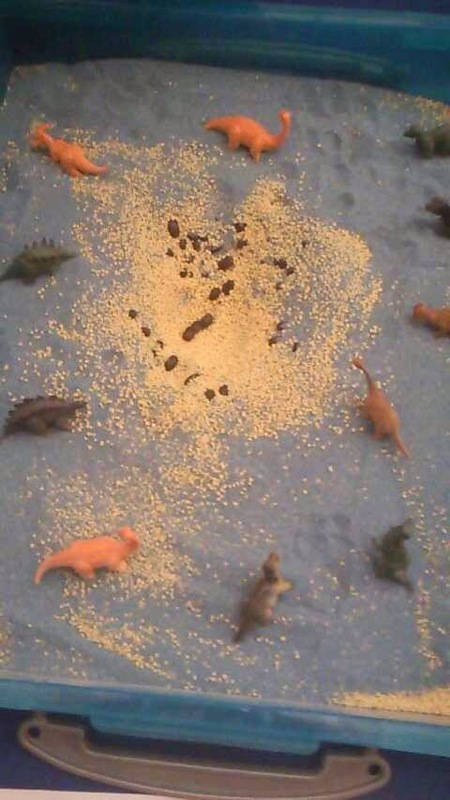 Big crater, complete with dinos! For the final section we explained how scientists relate meteorites to extinctions, and how there may be other causes such as massive volcanic eruptions called flood basalts. We then had a box of rocks, some of which were meteorites and some of which weren't, and we let the children determine which were which. They did this by using a magnet to pick out the magnetic rocks, which were more likely to be meteorites. 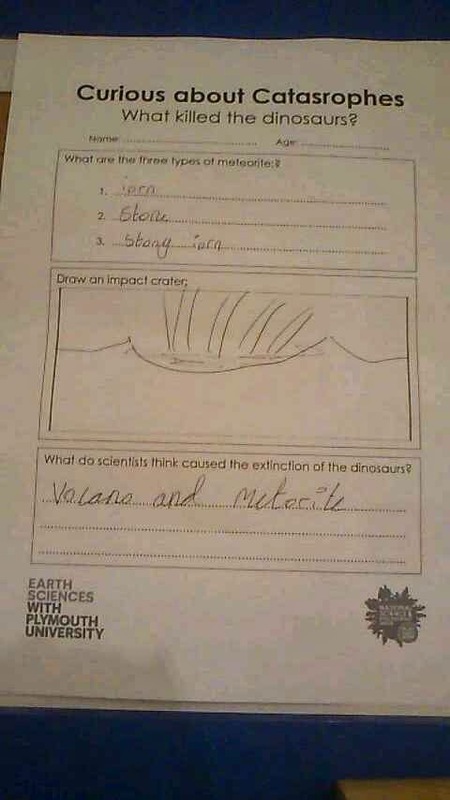 If there was time they also filled out a worksheet, which involved summarising the three types of meteorites, drawing an impact crater (or a dinosaur for the younger children) and explaining what scientists think killed the dinosaurs. Below are a couple of my favourite pictures - apologies for the bad quality of the pics, and that two of them are upside down! All of the children seemed to have a lot of fun, and I really enjoyed helping out with the activity, and I hope to do something like this again. I'm still here! Apologies for the lack of blogging recently, I've been rather busy! On Thursday and Friday I went to Exeter University to have a practice run of the palynology work that I will be doing with my samples. Palynology is the study of the fine grained particles and dust in sedimentary rocks. I was doing a palynofacies analysis, which involves looking at acid resistant organic matter, such as pollen and spores. This organic matter is obtained via adding hydrochloric acid and hydrofluoric acid to the samples to remove the carbonate and silicate minerals. The material that is left behind is then placed on a microscope slide to be analysed. I looked at some samples from one of the studies by one of the lecturers, and I counted each of the different types of organic matter. These included spores, pollen, plant tissue, marine microfossils and black debris. I tallied these up in order to get some indication of the nature of deposition of the sediment. A large amount of spores, pollen and plant tissue would indicate a terrestrial deposit, a large amount of marine microfossils would indicate a marine deposit and a large amount of black debris would indicate a coal deposit. In this study, most of the samples were terrestrial with a lot of pollen, spores and plant tissue, and one of them was a coal deposit, having a large amount of black debris. This study was a training exercise, to give me an idea of what I will be doing when my samples have been processed, so hopefully I'll be doing this again very soon. I shall end this post with a few pictures of the organic matter that I saw - the scale bar at the bottom of each one is 20 micrometres, or 0.02mm. You have probably all heard about the magnitude 4.1 earthquake that hit the Bristol Channel on Thursday at 1:21pm. It was felt by people in South Wales, Somerset and Devon (unfortunately not as far as Plymouth! ), but did not cause any significant damage. Earthquakes in the UK are more common than you might think - we have around 20-30 each year that are felt by people, and hundreds of smaller ones that are felt by sensitive instruments. The largest British earthquake occurred near the Dogger Bank, 60 miles offshore in the the North Sea, and it had a magnitude of 6.1. As it was so far out to sea, the damage was reduced, but it was still powerful enough to cause minor damage to some east coast buildings. The most damaging British earthquake occurred in Colchester in 1884 with a magnitude of 4.6, damaging 1,200 buildings. The picture below shows a map earthquakes from 1932 to 1970 with a magnitude of 3 and above (yellow) and earthquakes from 19070 to present with a magnitude of 2 and above (red). The UK experiences a magnitude 2 earthquake roughly once every two years, and a magnitude 5 earthquake roughly once every 10-20 years. Most earthquakes occur on the western side of the British mainland, and are nearly absent from eastern Scotland and north east England. 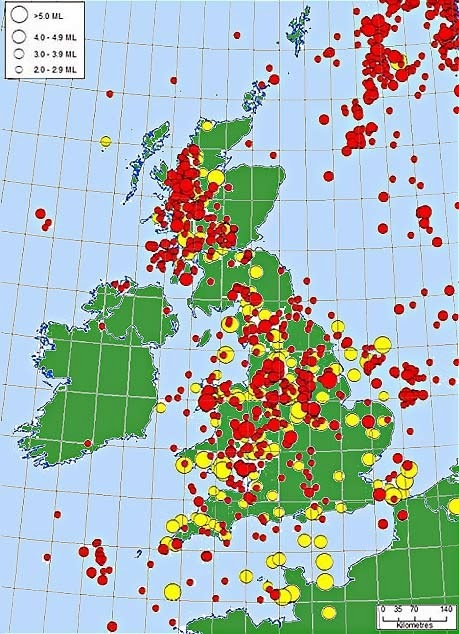 These earthquakes are due to the many faults in Britain. The actual driving forces are unclear, however it is likely that they include regional compression due to the motion of the Earth's plates and uplift due to the melting of ice sheets that used to cover Britain. Researchers in Canada have uncovered a new fossil site near to the Burgess Shale, which is famous for it's preservation of the soft parts of fossils. This new site is revealing fossils at an amazing rate, which will allow our understanding of animals from the Cambrian period (540-485 million years ago) to be significantly increased. So far, 12 new species has been found, but it is likely that new discoveries will continue to be made. The exact location of this new site is being kept confidential, to stop thieves from targeting it. The amount of fossils in the Burgess Shale and in the new site is due to the Cambrian explosion (540 million years ago), which was the cause of the rapid increase in the abundance and diversity of animals. There are many possible causes of this explosion. The ozone layer (which blocks out the lethal UV radiation) is believed to have formed during the Cambrian explosion, allowing for the development of complex life and life on land. The amount of oxygen in the atmosphere also increased during the Cambrian explosion, allowing larger, complex animals to grow, as they require a larger amount of oxygen to survive. Volcanically active mid ocean ridges during the Cambrian caused an increase in the amount of calcium in the oceans, allowing marine organisms to build hard body parts, such as skeletons, allowing for a greater diversity of complex life. All of this has allowed for more animals to be preserved from the Cambrian period, explaining why so many fossils are found from this time, and why I now want to go to Canada! 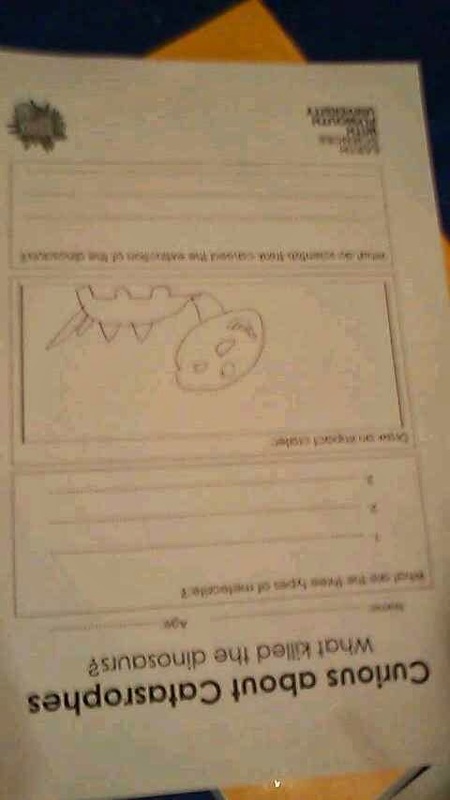 Now you all probably recognise the picture above. 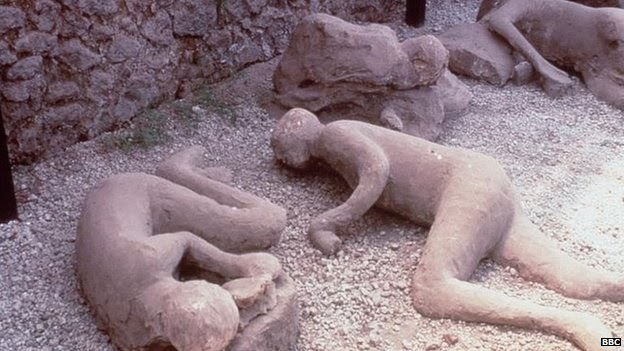 In 79AD, Mount Vesuvius erupted, wiping out the city of Pompeii, killing and burying its residents under a dense layer of ash. Scientists now believe that similar events may have occurred 130-120 million years ago, instantly killing the animals of the area and preserving them in a similar way. 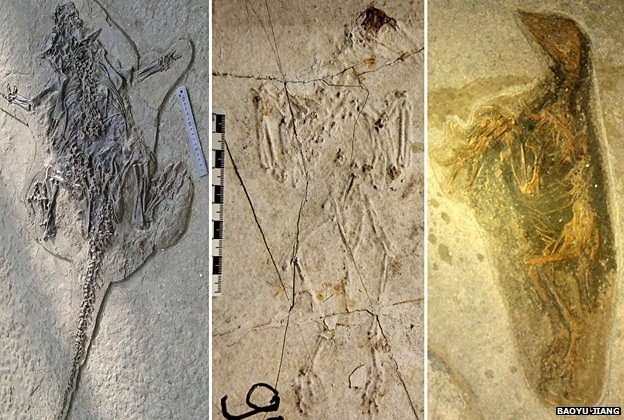 Fossils beds from the Liaoning province in NE China are the site of some exceptionally well preserved feathered dinosaurs, mammals, lizards, birds, fish and insects. They would have lived in an area that was surrounded by volcanoes, and would have been the victims of pyroclastic flows (I'll explain them in a minute) that spread out across the landscape. Like the people of Pompeii, they would have been killed instantly, before being buried under the ash, allowing them to be preserved in mid-movement. The animals were found together as their carcasses would have been transported by the flow and deposited in the same area. Pyroclastic flows consist of hot, dry rocks and hot gasses that travel away from a volcano after an eruption. The coarse rocks move along the ground, and a turbulent cloud of ash rises above them, which combined can destroy nearly anything. Flows can reach speeds of over 50 miles per hour and temperatures often range from 200-700 degrees centigrade. The rocks batter, destroy or carry away most objects and structures, whilst the temperatures burn things like vegetation and houses. Sites are then buried by the hot rocks and ash. So basically, you do not want to get in the way of one of these things! Although that's all very doom and gloomy, these ancient eruptions have allowed us to have these exceptionally well preserved fossils, giving palaeontologists a greater understanding of life and evolution from such a long time ago. I've been busy with my samples again in the lab. I put the stubborn sample that hadn't broken down into white spirit to help dissolve it further, before leaving it in boiling water overnight. I then re-sieved it over the sink, re-filtered it and put it back in the 40 degrees centigrade oven overnight. When it is was dry, I sieved it through 1mm, 150 micrometre and 63 micrometre sieves (it still wasn't completely broken down, so there was a lot of large material, hence the larger sieve). Large material from the stubborn sample! I then picked through my samples for microfossils for the over 150 micrometre material. This involved putting a thin amount of material on a picking tray, putting it on a microscope, and, using a fine paintbrush, looking at every single grain, and moving the microfossils from the tray to a slide. This was a lot of hard work, as the grains and microfossils were prone to either getting stuck to the paintbrush, or flicked off into the distance! I then stuck down the microfossils onto the slides from two of the samples, as there weren't very many in either of them. 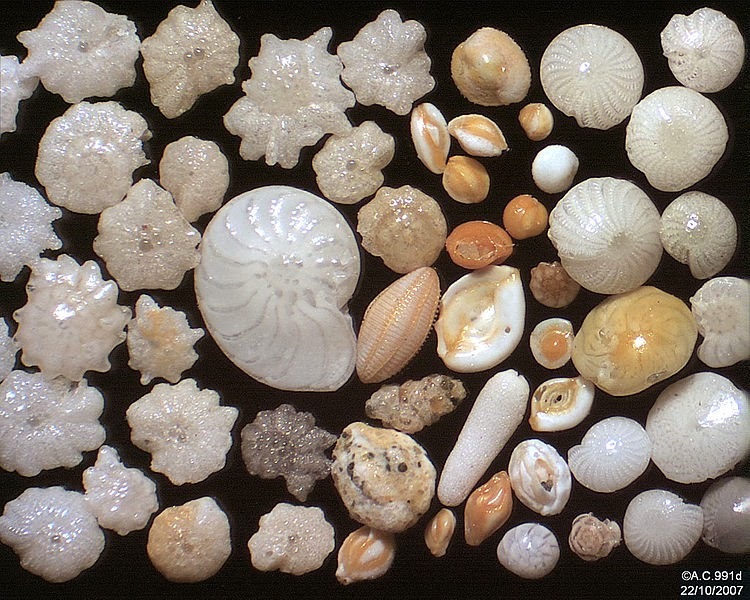 I then separated the microfossils from the other two samples, specifically picking out foraminifera (forams). I am now in the process of sticking down the forams, and I will then stick down the rest of the microfossils. Some of you may be wondering what on Earth foarms are! Well, they are marine organisms that first appeared around 540 million years ago, and are still alive today (well, not the ones that were around 540 million years ago!). They are split into two major groups - benthic (species that live on or within the seafloor sediment) and planktic (species that float in the water), and they generally have a shell, with either one or multiple chambers. I am using the forams and other fossils to determine where the samples came from - either from the deep water or near the coast. This will hopefully allow me to determine if they were affected by a tsunami. Last week I went to Bristol Museum with two of my lecturers to collect some more samples for my project. When we got there we were taken down into the Geology Storage Room, which was really cool! It had loads of moveable shelves with loads of amazing fossils on them. I could have stayed there all day! We looked at the rocks that some of the Scelidosaurus dinosaurs bones have been found in, along with a couple of the bones themselves. We took two samples from one of the rocks to be taken away for a palynological study (dust and pollen) and contemplated stealing some really cool samples with loads of fossils in! Somehow I don't think we would have gotten away with it! So in the pictures above, you can see that there were belemnites, crinoids and rip up clasts. You may be wondering what they are, so I thought I'd give you a quick explanation of each one. Belemnites were squid like animals, that were long and tube shaped. They are now extinct. Crinoids are stalked animals that look a bit like plants, but are in fact related to starfish. Some are still alive today. Rip up clasts are small pieces of mudstone that get ripped up (hence the name!) when a strong current passes over them. They can be transported quite far, and will then be deposited along with the rest of the sediment that is being carried by the current. We then went and had a look at the Scelidosaurus specimens that they had on show in Bristol museum. There were a few pieces that still had some skin attached, and they also had a really cool model of Scelidosaurus. Hi! This blog is going to be about anything Geology related that happens to me, or that I come across. Hope you enjoy it!